Once upon a time, just over 8 years ago in fact, Armor Games released an iOS port of their popular Flash physics puzzler Sushi Cat ($0.99). Now, if you’ve been reading TouchArcade for a while, you’re probably aware I’m the official “cat guy" on staff, and naturally I was a pretty big fan of Sushi Cat when it released. It had you aiming and releasing the titular Sushi Cat from the top of the screen where he’d fall and bounce around the level Plinko-style, hopefully collecting bites of sushi along the way. 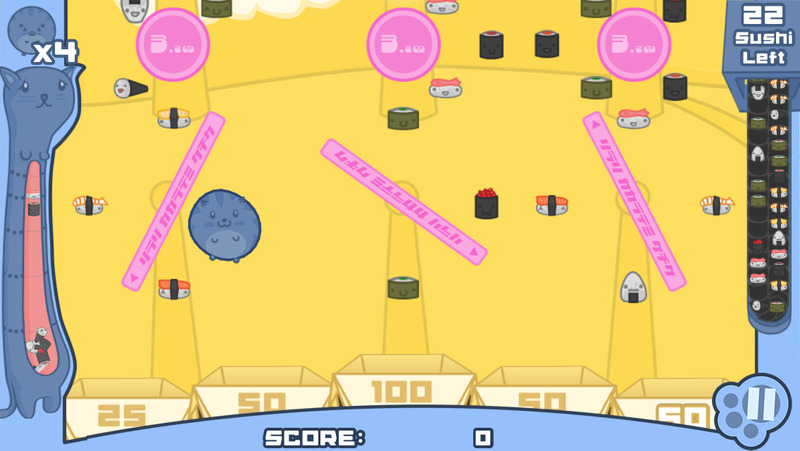 As Sushi Cat gobbled up those sushi bites, he became fatter and bouncier, and you’d ultimately end up landing in one of the bonus slots at the bottom of the screen which would contribute to your score. Collect enough pieces of sushi and you’d complete a level and move onto the next. It’s basically Peggle with cats. While it hasn’t been updated in a few years, Sushi Cat on iOS is 64-bit compliant and is still a ton of fun more than 8 years later, so I’d definitely recommend checking it out if you haven’t before. But that was then, and this is now. Sushi Cat is making his trimphant return to mobile in the form of a new word game called, very appropriately, Sushi Cat: Word Search Game. As the story goes, Sushi Cat is mistaken for a famous food critic and so is invited to tour the restaurants of Japan to sample their fine sushi cuisine. Each meal is represented by bites of sushi with letters on them and it’s your job to create as many words as possible from those letters. Once you create a word, our dear Sushi Cat gobbles them up as he is known to do. Seriously, this sounds like the ultimate fantasy scenario for Sushi Cat. What a lucky feline. Here’s a gif of the game in action. If you enjoy word games and adorably plump kitties, then Sushi Cat: Word Search Game should be right up your alley when it launches as a free to play game next Wednesday, July 25th. While a proper sequel to the original Sushi Cat was released back in 2011, it never made its way to mobile like the first game did, despite my pleas to Armor Games to do so. Armor Games, why do you enjoy making me sad like that? Oh what I wouldn’t do for a fully updated original Sushi Cat as well as a release of that sequel on mobile. That said, I do love me some word games, and Sushi Cat: Word Search Game looks like a fun one that will also allow that squishy little guy to be part of my life again, so I guess I can’t complain too much. Look for this latest Sushi Cat game to arrive next week.